Umpires are essential to our organization. Umpiring is a great way to both enjoy baseball and to work off your volunteer hours. Pocket Little League trains all volunteer umpires. We have had NCOA rules and mechanics training as well as guest instructors from the national Little League organization. 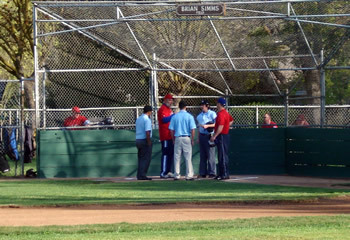 Umpires are expected to treat all players with respect and to observe the rules of conduct set forth by Little League. They should set a good example for the players, managers, coaches and spectators. If you are coaching, managing, or an elected Board member you will need to complete a volunteer application every season.